Third Coast Percussion will perform during Winter Water Fest at the Door Community Auditorium. Inspired by this year’s Celebrate Water Door County initiative, Door Community Auditorium (DCA) is holding Winter Water Fest, a fun-packed weekend of activities. 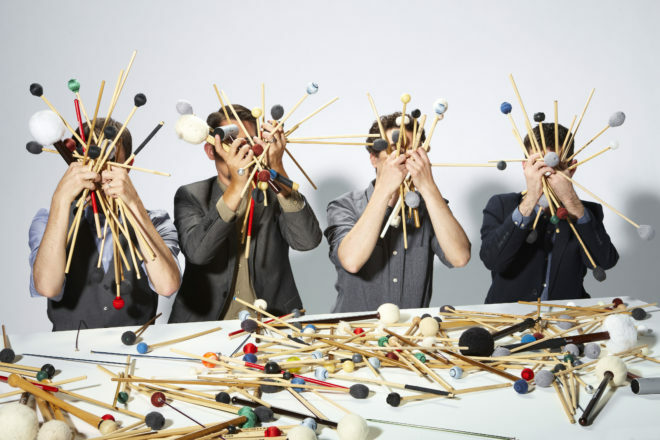 From Jan. 30 to Feb. 2, Chicago’s classically trained, Grammy-winning ensemble Third Coast Percussion will be in residence at DCA. The residency will consist of school performances on Jan. 30-31, followed by a public performance on Feb. 1, 7 pm. The performance is titled Paddle to the Sea. Focused around the classic children’s book and Academy Award-nominated film of the same name, Paddle to the Sea explores our relationship to the bodies of water that connect our lives. Third Coast Percussion composed a new score to be performed live with the film. Tickets are $25-48 per person, with $10 tickets available for students. On Feb. 2, 7 pm, local and regional poets with join with the chamber-music group Nine Worlds Ensemble to present Words on Water. Musicians will pair with poets to create a lively coffeehouse atmosphere and a powerful evening of entertainment. Nine Worlds Ensemble, whose music will weave in and out of the poetry readings, takes a distinctive approach to chamber music. The evening’s poets include Ralph Murre, Nancy Rafal, Ethel Davis, Rolf Olson, Francha Barnard, Kathryn Gahl, Marybeth Mattson, Sara Sarna, Sharon Auberle, Lisa Vihos, Albert DeGenova, Jim Maronek, Ann Heyse and Donna Johnson. Tickets are $17.50 per person. Seating is limited, and advance reservations are recommended. Tickets can be purchased in person, by calling 920.868.2728 or online at dcauditorium.org.